The C-STEM Math-ICT Curriculum and C-STEM ICT Pathway provide K-12 students with up to 13 years of hands-on integrated math and computer science education with coding in Blockly and Ch/C/C++ using Barobo Linkbot, Arduino, Raspberry Pi, and Lego Mindstorms NXT/EV3. Our curriculum, specially Math 7, Math 8, and Algebra 1 and Integrated Math I, has been increasingly adopted by schools nationwide. The C-STEM Math-ICT formal curriculum complements C-STEM GIRL/GIRL+ Summer Camps and Barobo Afterschool Program with project-based learning. The formal and informal programs therefore reinforce each other for hands-on computing and robotics. Focused on integrating computing and robotics into regular STEM classroom with hands-on project-based learning, the C-STEM Center has developed innovative computing and robotics technologies with C-STEM Studio and RoboBlockly, teaching strategies, textbooks, and courseware including lesson plans, PowerPoint lessons, video lessons, group computing activities, optional robotics activities, and assessment tools for readily integration of computer programming in C/C++ using Ch (a user-friendly C/C++ interpreter Ch) and robotics into the formal curricula in elementary schools, middle schools, high schools, and colleges. A-G courses fulfill subject requirements for freshman admission to the University of California and California State University systems and are so-called because there are seven general subject areas labeled “A” through “G.” C-STEM joins a distinguished group of programs with UC A-G Program Status. The A-G approved C-STEM courses at the UCOP web site can readily be added in a high school’s A-G course list. The RoboBlockly supplementary curriculum includes student self-guided Coding, Robotics, Math Activities, and theme-based Projects. The teacher-lead 1st to 9th grade specific Math Activities are Common Core State Standards -Mathematics compliant. The related Teacher’s Notes and comprehensive Teacher Resource Packets in PDF files for all these activities along with 39 video lessons help teachers integrate the RoboBlockly curriculum into their teaching. The C-STEM curriculum can be used ranging from four weeks as supplementary materials for STEM courses, one semester course, to a full-year course in formal curriculum, multi-year career pathways or academies, 13-year C-STEM ICT Pathway, as well as afterschool programs, and youth camps in both academic year and summer in school campuses and colleges. We have developed teaching technologies and unique C-STEM professional development to help STEM teachers including those without any prior computer programming and robotics experience to integrate and implement our rigorous curriculum in their teaching. You may check the credential requirements for middle school teachers and ones for high school teachers for teaching C-STEM courses. C-STEM provides a rigorous academic experience for students with 21st century problem-solving skills and preparing them for post-secondary study and career in STEM fields. New undergraduate applicants in UC online application can select C-STEM as a UC approved Educational Preparation Program for all UC campuses. 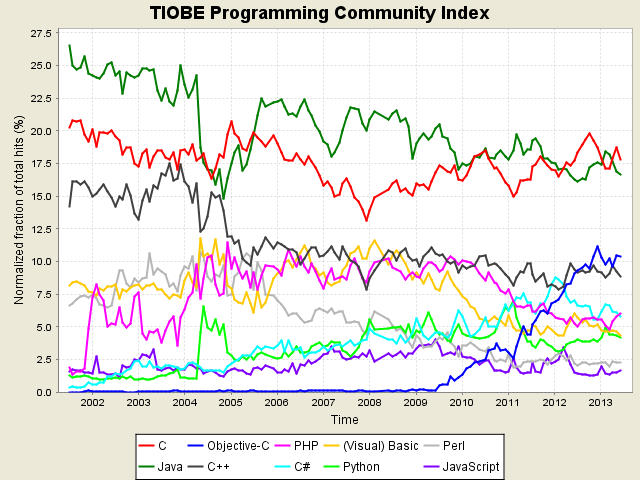 C is the most commonly used programming languages in industry. 90% of desktop applications including Word and PPT are developed in C, or its closed relative C++. All games and robots are developed in C/C++. C is one of the foundations for modern information technology and computer science. C is a standardized programming language with international standards. Writing computer programs is essential to solving complex science and engineering problems. 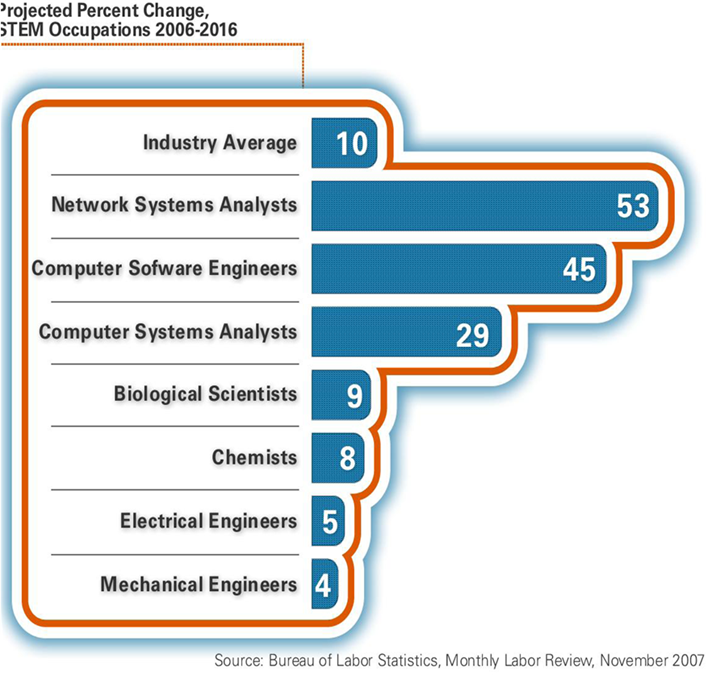 Computer programming is becoming a necessary skill for many professions. Computer programming can develop your critical thinking capabilities. C is one of the most commonly used programming languages in colleges and universities. C is the language of choice for programming embedded and mechatronic systems with hardware interface. All robot control software are programmed in C/C++. C excels as a model programming language. All other new languages follow the design of C.
Once you have learned C, you can pick up other languages without much difficulty by yourself because all other modern languages borrowed heavily from C.
Source: www.tiobe.com; Programming Community Index is one of the best known and most authoritative statistical sources. 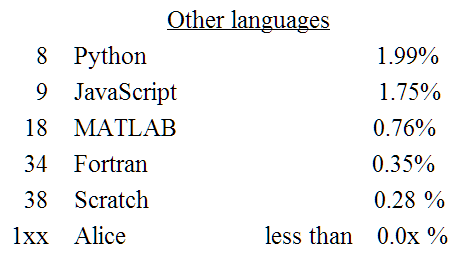 It indicates which programming languages are most used in industry. The index in April 2014 indicates that the C language family is the most widely used and has over 36% market share.